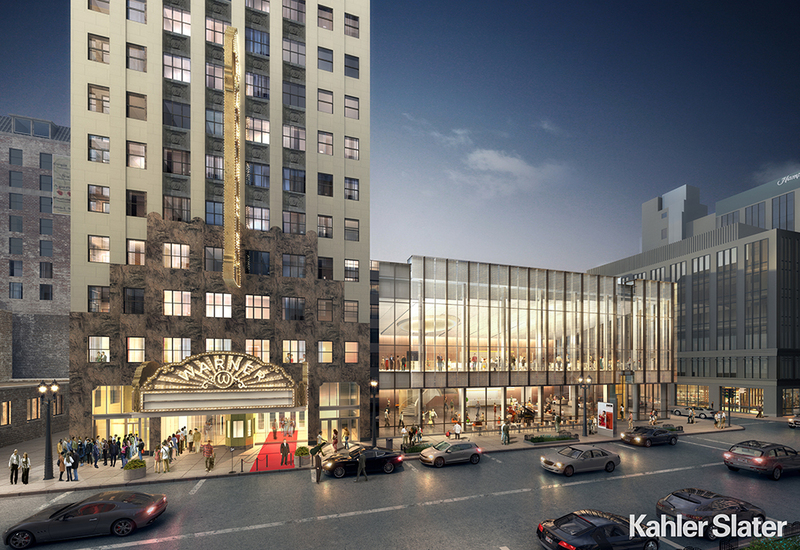 The Milwaukee Symphony Orchestra (MSO) is preparing to break ground on its renovation of the Warner Grand Theater and the construction of an adjacent lobby and reception building. The $80 million project is led by Milwaukee-based architecture firm Kahler Slater. The Art Deco Warner Grand Theater, located in Downtown Milwaukee, was designed by Chicago-based firm Rapp & Rapp in 1930. The 2,400 seat theater is topped by a 12-story office tower with marble and bronze detailing. Similar to cities across the Rust Belt, Milwaukee is pushing forward with the preservation of historic structures, such as the The Humphrey Scottish Rite Masonic Center, as tools for urban revival. Restoring the theater entails the refinement of original detailing and the installation of modern features. The historic lobby and original ticket booth will be restored to their pre-1950 condition. According to Kahler Slater’s CEO, George Meyer, existing Neo-Baroque finishes within the concert hall are in remarkably good condition, requiring minimal restorative work. However, the project calls for an intense engineering procedure to move the theater’s rear terracotta wall approximately 30 feet east to increase the stage’s size. The Journal Sentinel notes that saving the eastern elevation is necessary to secure $8 million in historic tax credits from the state and federal governments. Additionally, Kahler Slater will add new acoustical features behind historic details to transform the site into a first-class concert hall. To make way for the new lobby and reception area, the MSO will demolish an adjacent two-story restaurant space dating from 1936, as reported by On Milwaukee. While the restaurant building was originally a Moderne structure, past tenants such as Burger King and Taco Bell have wiped away that original detailing. The addition will add contemporary amenities adjacent to the historic structure. The first floor will largely facilitate circulation, while the second floor will be used as a secondary event space by the MSO. A circular skylight, placed above a centrally placed spiral staircase, will illuminate the space. Over the last decade, Kahler Slater has conducted a broad range of conservation projects in the Milwaukee area, including the restoration of the Richardsonian Romanesque Northwestern Mutual Life Insurance headquarters, designed by architect Solon Spencer Beman in 1886. The Milwaukee Symphony Orchestra is hoping to open its new performance space in fall 2020, allowing it to move out of its current home, the Marcus Center of the Performing Arts. Downtown Milwaukee is going through what could only be called a renaissance. Along with the proposed revitalization of the multi-block Grand Avenue Mall, a slew of towers from the shore of Lake Michigan to the west end of the downtown are changing the skyline of Milwaukee. It has been decades since Milwaukee has seen such a building boom. With construction starting later this year, the 25-story BMO Harris Financial Center will be one of the next to join what will be a transformed downtown. 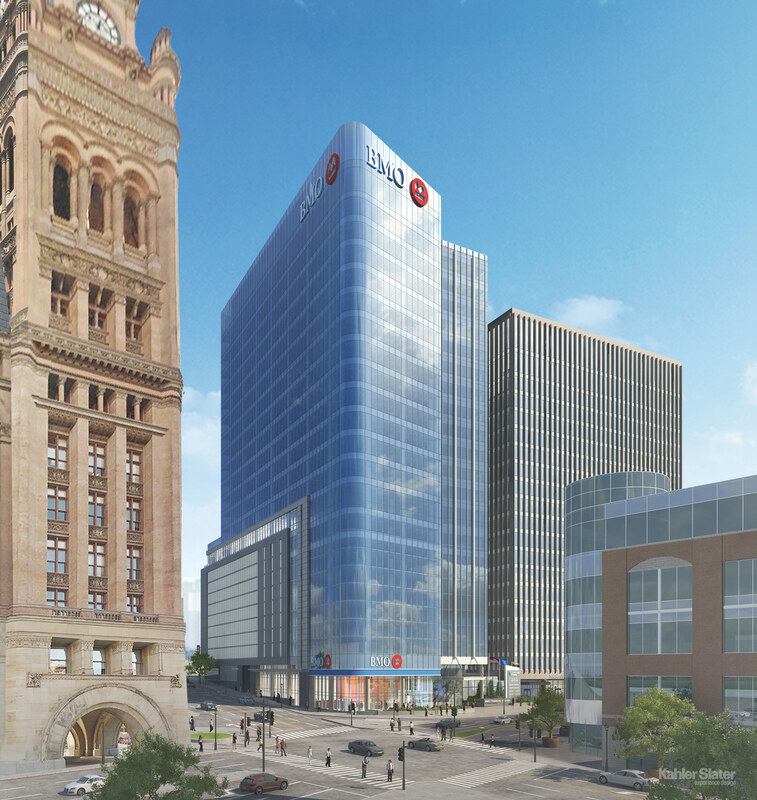 Designed by Milwaukee-based Kahler Slater, the new tower will sit immediately next to the current BMO Harris Building, home to the Chicago-based bank’s main Milwaukee office. Once complete, the bank will move to the new office tower and open a new branch in the building. The Irgens development firm, which is overseeing the new tower, will also lead the redevelopment of the older building. The current BMO Harris Building, a 20-story modernist block, was built in 1967. Currently, BMO Harris’s own five-story parking structure sits on the site. Just across from the site is the Flemish Renaissance revival–style City Hall, a National Historic Landmark and one of the most iconic structures in the city. This site is also in the heart of the city’s historic financial district. While much of the latest development has shifted to the south and east, closer to the lake, the area has continued to see more and more traffic, as theater and entertainment spaces have come to the area. The new tower’s massing will make reference to its modernist neighbor, while also implying slenderness through its split form. The base of the tower will be a 10-story podium of parking and public-facing amenities. Retail and the bank’s retail branch will make up the ground level. The facade will also add to its vertical reading by stretching down over the podium and up past the roofline. Besides the few surviving late 19th-century structures, Milwaukee’s downtown is a milieu of parking structures and second-string postmodern towers. When the BMO Harris Financial Center is complete in 2019, glassy towers—a typology that is only now making its way to the city—will dominate the skyline. Add in the new bikeshare program and forthcoming streetcar, and Milwaukee’s downtown will be unrecognizable.